Brush India Manufactures and export all kinds of Sweeping Brushes and are proud to be your one stop source for all sweeper and scrubber brushes and brooms. 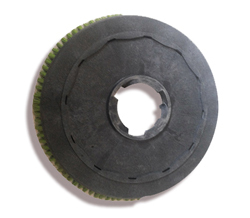 We are currently manufacturing a complete line of sweeper and scrubber main brooms. Our brushes are staple set, using the highest quality cores and fill material available. Every brush is checked for precision dynamically balanced if out of specification. Our manufacturing equipment is considered one of the best precision staple set units in the world. YOU WILL NOTICE THE DIFFERENCE WHEN USING OUR BRUSHES. 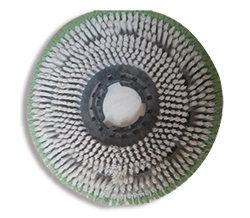 All of our circular brushes are supplied on hygienic, impact resistant, High Density plastic backs. Polypropylene Monofilaments Cleaning and Scrubbing For medium scrubbing of floor finishes. 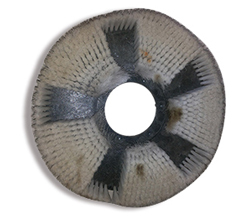 Available in stiff, crimped, Used on large cleaning machines. 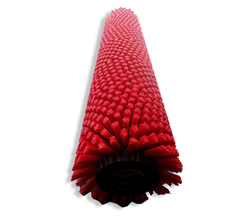 Our best selling 'low cost' scrubbing brush. Bassine Fibre Can be used in wet condition Stiff natural bassine fibre for general (light) wet scrubbing. The fibre can also be used dry It is suitable for use in hazardous non-spark areas as it is free of static..
Gumati Fibre - Polishing and Smoothening of Floors Gumati (Arenga) is a medium stiff natural fibre, used for general purpose polishing. It cannot be used wet. High-Buff Polishing of Floors is a mixture of natural fibre and grey coloured soft 0.6mm (0.024") nylon, impregnated with finely graded mineral polishing compound.